This frame features a set of authentic Patrick Kane 2009 NHL All-Star jersey numbers which have been personally signed by the Chicago Blackhawks star himself. The numbers in the frame are game-ready numbers, the same as you would see on any officially licensed jersey. In 2009, the 57th annual NHL All-Star game was hosted by Montreal and played at the Bell Centre. Kane was selected first overall by the Chicago Blackhawks in 2007. He had an incredible rookie season scoring 21 goals and 51 assists for a total of 72 points; leading Kane to winning the Calder Memorial Trophy for rookie of the year. This was the beginning of his All-Star career. Two years after entering the NHL Kane was making a trip to Montreal to attend his very first NHL All-Star game. Upon arriving, Kane participated in the NHL Breakaway Challenge. Falling short of being victorious, Kane demonstrated his lethal and creative hockey skills during this competition. Kane also played in the NHL All-Star game itself. It was a back and forth game between both the Western Conference and Eastern Conference. Down by one goal in the third Patrick Kane assisted on a Jonathan Toews goal to tie the game at 9-9. As the game progressed the Blackhawks sniper scored to take the lead 11-10. The game was so tight it had to be decided in a shootout. Although in his first NHL All-Star appearance Kane’s team did not win, it was certainly a stepping stone for Kane’s career. One year after attending his first All-Star game Kane utilized his talents to help Chicago lift the Stanley Cup in 2010. This would be Kane’s first of three Stanley Cup victories. 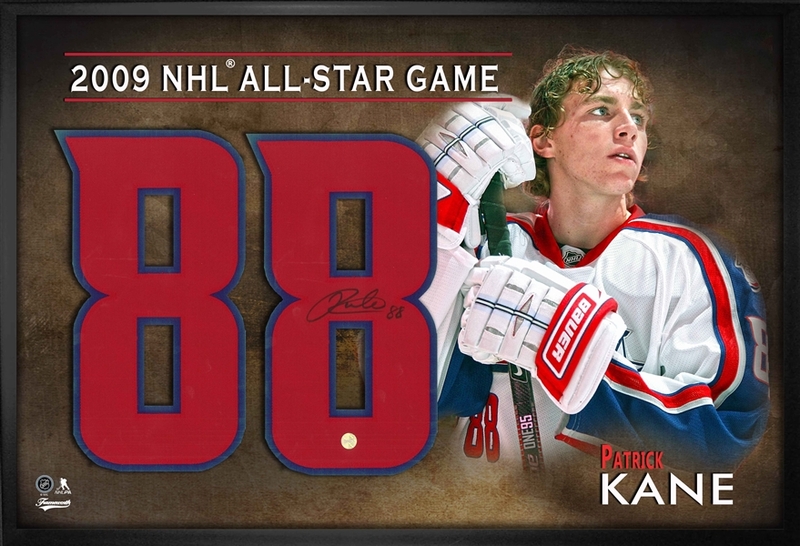 Patrick Kane has truly had himself an All-Star career and was named one of the “Top 100 greatest Players” during the NHL Centennial season. This NHL & NHLPA officially licensed product is a framed piece of NHL All-Star history and comes with a Hologram and Certificate of Authenticity. Frameworth is the exclusive autograph provider of Patrick Kane memorabilia. Finished Size: 18x26".